The mill is surrounded by pine woods and the house has a separate lawned garden area with stone tables made from the old mill stones. running down to the edge of the lake in which water lilies are growing. The entrance door leads into a passage off which there is a large bedroom with a double bed, complete with a minstrels gallery! Adjacent is a separate bathroom. Another bedroom with a double bed is at the end of the passage. This has stairs leading down to an en suite bathroom in a room below the bedroom. Steps lead up to the living room which has seating around an open fire. A dining area has a table for 8 persons. Open to the dining area is a modern kitchen complete with a refrigerator and a dish washer. From the dining area, stairs lead up to a double bedroom with an ensuite shower room. Underneath the stairs, there is a pullout bed for an additional person. In front of the house is a small garden area which has a barbecue and garden furniture. 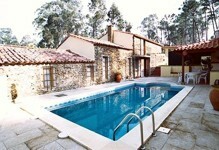 At the rear is a courtyard enclosing the swimming pool. A swimming pool is in the patio at the rear of the house with a shower. Also this patio area has a covered barbecue and a fridge. A wire fence with a gate runs along the lake for the protection of smaller children. The other sides have a stone wall. The long Atlantic beaches of Apulia are about 4 kilometers away. One of the features of Apulia is a collection of fishermen's huts which their families have converted to restaurants serving barbecued fresh fish caught by the fisherman. A few kilometers to the south is the resort of Póvoa de Varzim which has a fishing harbour and a marina. There are many restaurants and a good casino. A 30 minute car drive brings you to Porto which has been given the status of a World Heritage Site by UNESCO. A similar drive will bring you to Braga which is the religious capital of Portugal, to Guimaraes which was the capital of Portugal during the period that Lisbon was occupied by the Moors and also the old sailing city of Viana do Castelo. To the east is the National Park of Peneda-Geres where there are spectacular walks in the mountains where the Celtic way of life has changed little over the centuries. An opportunity should be taken to visit the local town of Barcelos on Thursday morning to buy agricultural produce, pottery, shoes or textiles.